Having a chocolate fountain at any event or party will make it more elegant and unique but more importantly, it will make it fun. It really will captivate your guests and will give them something to talk about. It is a great alternative to having desserts at any function and the choices of what you can have are endless. You could choose from pieces of fruit, marshmallows, popcorn, biscuits and anything else you could dip into chocolate. There is the choice of white, dark and milk chocolate or why not have a combination of all 3? These are lovely to have at weddings and can make a lovely feature on the food table. 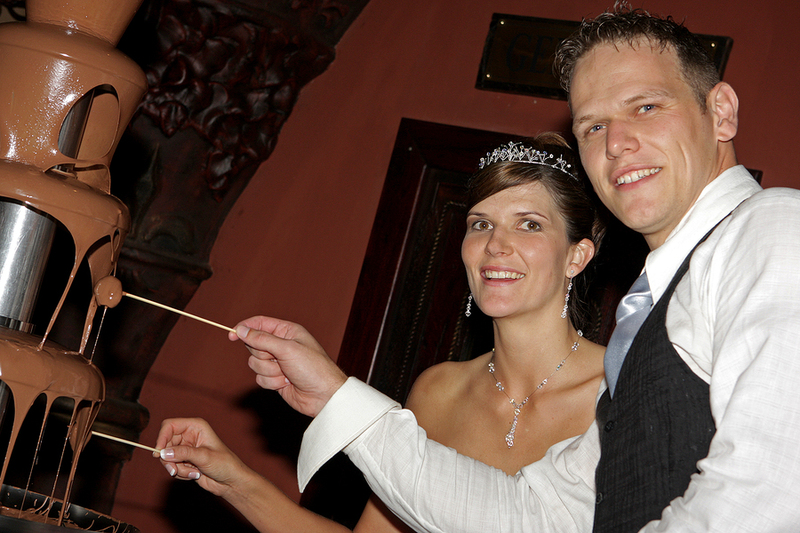 We can make that special occasion just that little more special through the hire of chocolate fountains where you can genuinely enjoy Belgian chocolate. Your guests will truly enjoy this magnificent treat throughout the day and night. Our team have developed many packages to suit you needs, so that if you are looking for an affordable solution or have a budget to blow then we will help you to select the best possible chocolate fountain that will be ideal for your special occasion and one which will keep your guests happy. We will hire out our chocolate fountains between 3 to 4 hours and will be more than happy to make suggestions and offer you additional options such as illuminations, napkins and of course the operators’ uniform. We can also supply candy floss and popcorn machine hire to your package, so please give us a call today to discuss your requirements.